I've recently developed a serious addiction to avocado. Don't get me wrong, I've always loved it--I eat guacamole every chance I get--but this is something different altogether. Different as in, I've eaten an avocado every single day for the past month or so. So, yeah. It's a pretty intense attachment. It all started when I ordered the avocado toasts from the little juice bar at Great Jones Spa downstairs from the CA Creative offices. They were divine. 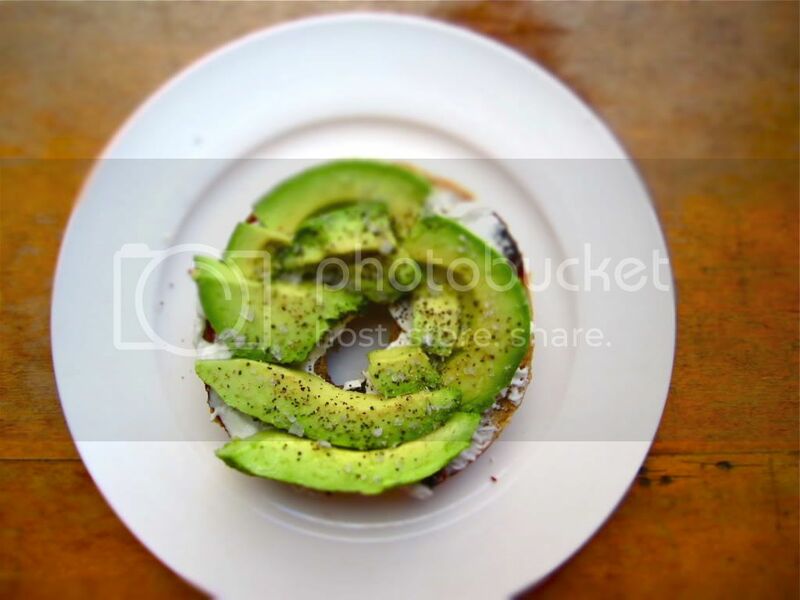 Served on lightly toasted sprouted bread with a thin, creamy layer of tofutti, topped with sliced avocado, olive oil, and a sprinkling of salt and pepper, they were the very definition of the simple, easy, deliciousness I so love in my meals. And so, of course, I had to recreate it at home. Slice the bagel in half lengthwise and toast. I don't have a toaster (takes up too much counter space), so I drizzled some olive oil in a nonstick pan over medium heat and toasted the halves face-down for a few minutes until they were nicely browned and crisp at the edges. Spread the Tofutti evenly on both slices. Drizzle with a little olive oil. Pit and thinly slice the avocado. Lay the slices gently down on both halves. Sprinkle with a pinch of Maldon salt and a few grindings of fresh black pepper. Enjoy. This looks delicious! I also have a little obsession with avocado... hopefully I'll be able to find Tofutti and Maldon so I can recreate this recipe! They're both sold at Whole Foods! Great recipe but I don't know why I always feel sick after eating avocados. Maybe because it's too rich for me or something. Weird. Beautiful photo styling. My favorite foods are simple meals like this. I will try this recipe! Yummy! I loove the spicy eggs and avocado toast from The Fat Radish. These seem so easy to make, I need to start making variations of it at home. Ooh I've never had that from The Fat Radish! I'll have to order it the next time I'm there. You know, I've never actually worked with Himalayan pink salt, but I've always wanted to try it out. Putting it on my grocery list! The day I discovered avocados I thought- what a strange looking obscure thing to eat. Low and behold it changed my life forever and let it just be said I'm an expert avocado picker and eater. I literally eat them daily and will and this to my repetoire!! Love your posts and your writing. This is a great basic recipe. This also can be used as a spread for a sandwich.My favorite! I love this. I have avocados in my fridge. This will be a nice thing to try. Apa Saja Penyebab Kencing Nanah?